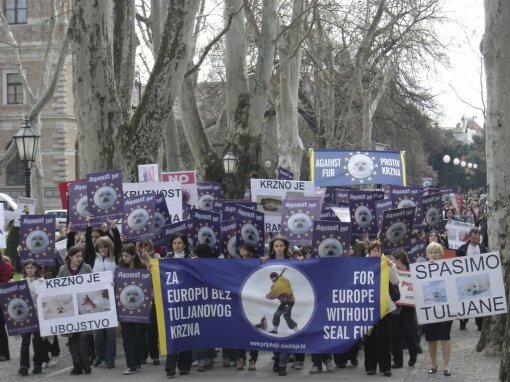 After the first demo in Ljubljana and the second in Zagreb, Animal Friends invites you to the third very important demo against the killing of animals for fur which will take place in front of the European Commission in Brussels. The goal of the demo is to ban the import of seal fur to the European Union market. The fight for seals is at its peak. The EU is deciding whether the law will be implemented as we speak. Now is the crucial moment to inform the MEPs that the citizens of Europe do not agree with the slaughter of baby seals in Canada and that they stand firmly against it. Thus you should apply for the organized bus trip to Brussels so you could raise your voice for the innocent victims of fashion and profit together with people from around Europe. The trip to Belgium is free of charge since you insure your journey by filling out an application and paying a 15 Euro fee to the organization (by credit card or to a bank account). Ensure your free days and be part of a historical moment. Do not hesitate to fill out the application!